The above info came from Rachael, and was edited by yours truly (contact me). The image came from CelsForSale.com. 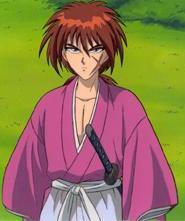 Kenshin is a gentle, polite man who lives at the Kamiya Dojo with Kaoru and Yahiko. He fought during the revolution as "Battousai the Manslayer", but vowed to Tomoe that he wouldn't be a manslayer after the Revolution, and so he became a wanderer. After 10 years, he met Kaoru and started to live at her place. Kenshin has a peculiar style of speech in which he uses "gozaru," an extra modest form of the verb "to be." He also uses the "samurai" pronoun "sessha," which is supposed to be polite. He also prefers doing the laundry, cooking, and playing with Ayame and Suzume to fighting. However, when he needs to protect someone, he will fight, and well. He uses the Hiten Mitsurugi style, which revolves around predicting an opponent's moves. Pushed too far, however, and Kenshin will revert back to his former self, Battousai. It is easy to tell when this happens. First, his eyes glow amber. Then, his speech changes. He no longer uses the cute "de gozaru" or the polite "sessha," but the more masculine, vulgar "ore" instead. Many people are after Kenshin, either for revenge or because he's "in the way." Many have tried to force him to become Battousai again, but only a couple of people have actually succeeded. 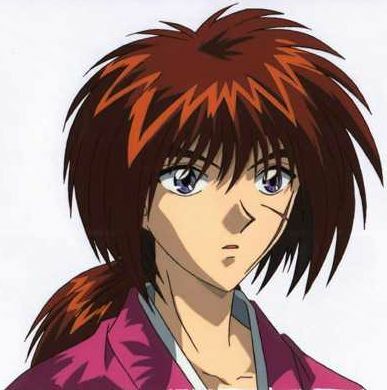 Kenshin Himura was born a peasant under the name Shinta, with no family name. Kogoro Katsura, the leader of the division he fought in during the Boshin War that gave him the family name of Himura, and Shinta was renamed to Kenshin by Seijuro Hiko after Hiko saved his life and took him as an apprentice. 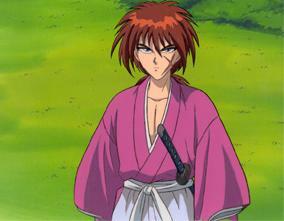 Kenshin got the scar on his face from two different sources. 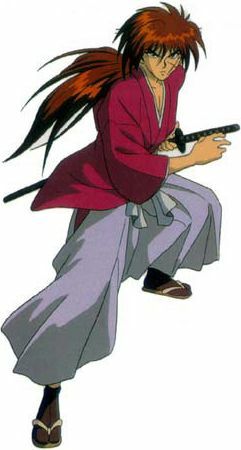 The vertical portion he received first while fighting Tomoe's fiance, Kiyosato Akira. Then the horizontal scar was made by his betrothed. He was fighting someone, and as he was dealing the death stoke, she got in the way, and as she was dying in his arms, she picked up her dagger and added the line to make the cross. In the manga, the dagger was knocked from her hand and coincidentally made the cut. The above description came from Rachael, and was edited by yours truly (contact me).